Snack Girl's search for healthy crackers never ends. I am always looking for that holy grail of a packaged snack that is also good for you. Recently, I received a box of Wheat Thins in the mail (hey, companies send me crackers). And, I purchased some at the grocery store. Also, my pal Hemi over at Fooducate posted this article: Will Kraft Deliver on its Whole Wheat Promise? and guess what? He talked about Wheat Thins! Kraft put out a press release saying "it will contribute more than 9 billion servings of whole grain to American diets each year". Wow! That is fantastic! More whole grain means more fiber and hopefully better choices for consumers. Is Kraft reading Snack Girl and/or listening to the needs of consumers? I found the 100% Whole Grain Wheat Thins at my grocery store. I was excited that more nutrition had been packed into what is an "okay" cracker choice (better than Ritz Crackers worse than Doctor Kracker). Until I read the label! Bummer. The 100% Whole Grain is on the right because it should be the RIGHT choice. But, if you can read it you can see that there is no increase in fiber per serving. The two are EXACTLY the same. Shouldn't an increase of 10 grams of whole grain per serving do SOMETHING to the fiber content? 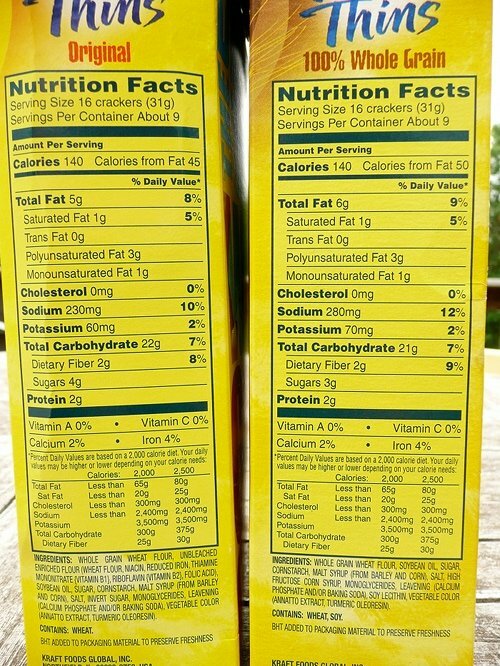 Also, why is there high fructose corn syrup and more sodium in the 100% Whole Grain versus the Original? I called Kraft (there is a phone number on the box) to ask them to explain why there is no nutritional difference between these products. They said it would take 7 to 10 business days to research my question. Kraft, I am waiting for your call.....sitting by the phone....really!!! 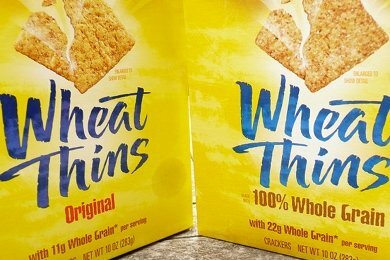 Why aren't the 100% whole grain Wheat Thins any different? Yup!! Comparing regular Tostitos corn chips to their whole wheat corn chips -- same story!!! But the whole wheat ones had a gram more sugar per serving. Thanks so much for showing the TRUTH about "100% Whole Grain" labeling. I always read the nutrition labels no matter what the rest of the package says, and have found that we're being misled left and right! This, however is ridiculous. The "100% Whole Grain" version is WORSE in some places? Sheesh! Just more evidence that we should eat fresh foods most of the time and reserve processed foods for treats. Then it doesn't matter which one you eat. Why the high-fructose corn syrup, you ask? Well that's easy, it's called tax subsidies for corn growers, it's called Monsanto and Con-Agra, it's called "how many ways can we stuff this genetically-modified diabeetus death syrup, into any and every product imaginable from crackers to batteries to gasoline additives." Cash is king my friends. Food safety is up to you. If people really want whole grains, the best thing to do is eat them as they are rather than as crackers. If I were going to eat crackers, I'd choose Mary's Gone Crackers or Dr. Kracker, as you mentioned. The whole grain claim on most labels is misleading. As a Registered Dietitian, I have no qualms saying that. I don't see how it is actually possible for the product not to improve in certain nutrients if it is 100 whole grain. If you just look at a side-by-side of refined (white) wheat flour vs whole wheat flour, the whole wheat has a decidedly better nutritional profile. Maybe those nuntrients just aren't the ones listed on the box?! That is exactly what I am thinking. And that is why I called them because I was hoping they would tell me that the box isn't quantifying the difference between them. Or they are the same crackers in different boxes. @Austin Personal Trainer - Sadly I agree with you. I am digusted at the food industry. I think "healthy crackers" is an oxymoron. Glad this seemed odd to you, too. Not that I'm defending food manufacturers--it appears that the sodium did increase, presumably to cover the whole grain taste, but the whole grain benefits should be real! I had just this conversation about another brand of crackers this past weekend! It's ridiculous. Grr. Wow! That's ridiculous! I am getting better at reading EVERY label. I got into the habit of not reading labels of food that claim whole grain or whole wheat, but this just goes to show that you can put anything on the box! Thanks for the post!! I have the Triscuit Thin Crisps and they are better than both of these and only have 3-4 ingredients....none of which is High Fructose Corn Syrup. They have less sodium more protein and NO sugar! I love my Triscuits! No sugar, no trans fat, no cholesterol. Only 4 ingredients!!! They pair very nicely with The Laughing Cow wedges. YUM! You all have nailed it. Marketing at its best. Love how the 1g fat is *nowhere to be found* There's nothing like the whole food. Crackers like WASA & Ryvita are about the best we've found for whole grains lately. The flavor from these definitely comes from what you put on them. They're not as tasty at Wheat Thins but are a nice choice to have. I hate how they add more sweetness to whole grain products. I LIKE the twigs and sticks taste to whole grain foods, I don't want to taste sugar I want to taste grains! My son makes a good flatbread with whole grain flour, oats, olive oil and just enough salt to taste. Just pat it out and cook it. It's plain, but it's a cracker, goes great with hummus or cheese! Two habits we all need to have: 1. Always investigate advertising. 2. Always read the label. If everyone would do this, maybe they would stop all the misleading advertising. Probably not, but they might! Karen: your son's flatbread sounds like a winner! Can you share the recipe or a link for it? Grew up reading the labels on packages, so quirks like this come as no surprise here. The addition of HFCS is very strange. Guess they figure that we can't handle the flavor of unaltered grain.